Over the recent months, the small landlocked country of Burundi in Central Africa has seen bouts of political violence and restrictions of civil liberties. The worrying developments in one of the poorest countries on the planet prompted the UN Security Council to issue a press statement on 10 April, noting political tensions and encroachments on the press and opposition in the run up to the 2015 elections. In the aftermath of the country’s independence in 1962, the Tutsi minority ruled the country for three decades. Following the assassination of President Melchior Ndadaye on 21 October 1993, Burundi was consumed until 2002 by a gruesome civil war during which approximately 300,000 people died. With the signing of the Arusha peace accords in 2000, the country found relative calm. In 2005, the former rebel group CNDD-FDD (National Council for the Defense of Democracy-Forces for the Defense of Democracy) won the multi-party election, turning the old power balance on its head. Pierre Nkurunziza, who was appointed president by the transitional national assembly, failed to deliver on his promises during the 5-year transitional period. He was nevertheless elected in the 2010 elections also thanks to political interference in the electoral process. Since then, political space has been continuously shrinking. Most prominently, on 4 June 2013, the government passed a very restrictive media law. All the while, raptures inside the ruling coalition widened and eventually broke to the fore on 1 February 2014, when President Pierre Nkurunziza sacked his First Vice President Bernard Busokoza, minister of the opposition party Union for National Progress (UPRONA). The conflict is primarily political in nature and should not be reduced to ethnicity. Following his dismissal and meddling in their internal affairs by CNDD-FDD, three UPRONA ministers resigned in protest, causing the only opposition party in parliament to quarrel and eventually split about their respective replacements. This development led the International Crisis Group on 1 March to conclude in its monthly Crisis Watch that the situation in the central African country had deteriorated. Then, in early March, 69 members of the opposition party Movement for Solidarity and Democracy (MSD) clashed with the police and were arrested – many arbitrarily – for “armed revolt.” The developments caused UN Secretary-General Ban Ki-moon to express his deep concern on 13 March about the confrontations. A week later, on 21 March, after just one day of trial, authorities sentenced 21 members of MSD to life imprisonment and put another 24 behind bars for other prison terms. Leader of MSD Alexis Sinduhije remains in hiding. 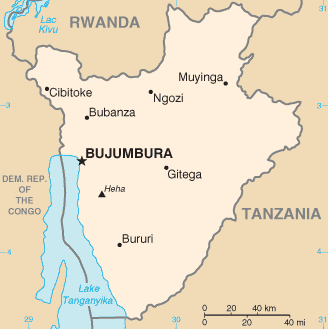 The council of Bujumbura later also issued a verdict encroaching further upon the right to peaceful assembly. Meanwhile, the crisis continued. Nkurunziza fueled political tensions when he introduced in late March constitutional amendments to remove presidential term limits. The proposal was struck down by one vote only. The fate of Nkurunziza is shared by incumbent presidents all throughout the region. Presidential elections are scheduled in the DR Congo (2016), Rwanda (2017) and Uganda (2016) with Kabila and Kagame unable to run for a new term. (Museveni changed the term limit in 2005). Each President has been fishy about his respective political ambitions. For a neat overview of developments in Burundi, consult the website of the UN Office in Burundi (BNUD) and reports by the UN Secretary-General. Crisis Group and Security Council Report provide sound political analysis. For detailed study on the situation of human rights in Burundi, see reporting by the US State Department, Human Rights Watch, Amnesty International, and the UN Office of the High Commissioner for Human Rights. In-depth reporting by IRIN News.